Decorating our family room has been a labor of love to say the least. I shared about a month ago that our front door opens directly into the room and right in to the center of the room. This has ruled out typical design tricks like positioning the back of the couch perpendicular to the outer door frame and placing a console behind the couch to act as an entryway. Our long term plan is to buy a new sectional to decorate the room like the design below since this room will act as our family room. Until then, I've focused the seating area around the fireplace with the couch facing the fireplace and a seating area structured around it. 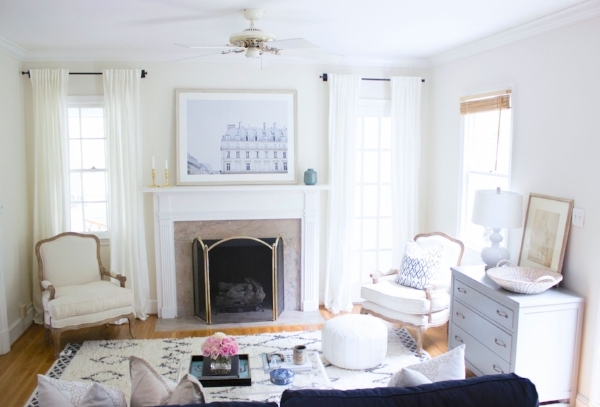 I've built the room with the furniture we had in our last apartment - the moroccan rug, blue couch, pouf and clear acrylic coffee table and added some new pieces like the bergere chairs, oversized Paris rooftop print and gray chest for a relaxed chic look. The front door is right next to the gray chest allowing for an easy flow into the dining room. The entryway is behind the couch by the stairwell with two key pieces- a runner and a bench. The bench acts as a drop zone for things like purses, shoes and mail. The runner helps frame the walk way in the room giving the area behind the couch structure and purpose. This setup works best against the stairwell since they bring a feeling of a foyer and already dictate the walk way flow of the house. If you don't have a stairwell and are using a wall nearby - pair the bench and runner with wall hooks to work as a coat drop.